A new interview with Shigeru Miyamoto reveals Nintendo's ongoing efforts to create cartoon adaptations of its Pikmin franchise. Pikmin 3 is scheduled to debut on Nintendo's Wii U console at some, as yet undetermined date later this year. While we don't know when that game will appear, we do know that Nintendo hopes to precede its release with a series of animations detailing the world the titular Pikmin live within. During a recent interview with Polygon, Super Mario Bros. creator Shigeru Miyamoto showed off the current progress of one such animation, while explaining that he had personally been working on the vignette with assistance from an external animation studio. 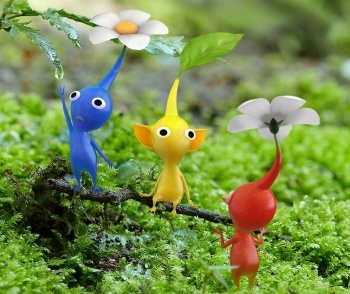 The cartoon, and the others like it, are to be animated using relatively simple CGI techniques, and according to Miyamoto the goal is to have a selection of 'toons available prior to the release of Pikmin 3, with the videos most likely appearing as downloadable clips for the Nintendo 3DS handheld. "They'll be released sometime before the release of Pikmin 3," Miyamoto told Polygon. "Possibly as a Nintendo video. If they're popular we could consider selling them." But why? Since when has Nintendo created tie-in cartoons to promote a game that has yet to be released? Yes, there were the abominable Super Mario Bros. and Legend of Zelda-themed cartoons of the early 90s, but Nintendo had no real hand in those shows. Why would it now jump into the animation game? "I didn't want to license our characters out to someone else to create films," Miyamoto said. "Instead, since I used to draw four-panel comics when I was younger, I thought it would be fun to bring a four-panel comic approach to creating video content, so we started work on these Pikmin videos." "We didn't have a good opportunity to announce that we were doing this, so while we were working on the movies we also created the Pikmin video that opened our E3 presentation last year," he adds. Is this news exciting? Yawn worthy? That all depends on how much you love Pikmin. That said, we can't remember the last time Shigeru Miyamoto created something that wasn't engaging and fun, so we're on board if he wants to spend some time sketching cartoons based on inexplicably ambulatory plant life. Wait, they are plants, right? The Pikmin? Nintendo's grasp of hypothetical biology has never been its strong suit, but seriously, can we get some official confirmation on whether or not those lil' guys have chlorophyll flowing through their veins? Based on those glassy stares, I have to assume they don't have souls, but I'd at least like to know what happens if you drop a rock on a squad of them.